Alison Shaffer: $15 off a Fresh All-Natural Harvestland Turkey from BJ’s Wholesale Club when you buy 4 qualifying products. 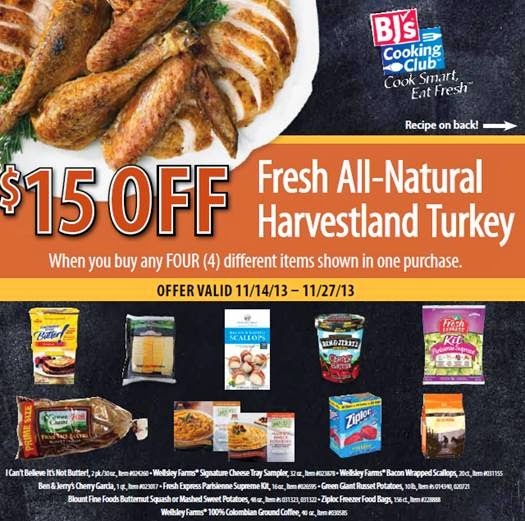 $15 off a Fresh All-Natural Harvestland Turkey from BJ’s Wholesale Club when you buy 4 qualifying products. · I Can’t Believe It’s Not Butter!, 2 pk./30 oz. · Wellsley Farms® Signature Cheese Tray Sampler, 32 oz. · Wellsley Farms® Bacon Wrapped Scallops, 20 ct.
· Ben & Jerry’s Cherry Garcia, 1 qt. · Fresh Express Parisienne Supreme Kit, 16 oz. · Green Giant Russet Potatoes, 10 lb. · Blount Fine Foods Butternut Squash or Mashed Sweet Potatoes, 48 oz. · Ziploc Freezer Food Bags, 156 ct.
· Wellsley Farms® 100% Colombian Ground Coffee, 40 oz. The coupon can be used at any BJ’s locations now through November 27. If you’re not a club member, you can still shop and save. The wholesale club is offering a Free 60-Day Trial Membership, which can be activated until December 31. The risk-free, trial membership consists of full-member benefits and no surcharge.